I grew up without consistent health insurance. Depending on the jobs our parents had at the time, neither had college degrees, we had either no insurance at all, minimal insurance like ER visits only, or just plain poor coverage. Consequently, the only time we saw a physician was for required school physicals or when a piece of our body was hanging off at an odd angle. For better or worse, we survived. When I was sixteen I started working as a nurses aide and as a bonus, received some health benefits. At twenty five I graduated form nursing school and the health care benefits came rolling in, high on the hog style. For a minimal paycheck deduction I had excellent coverage in and out of the hospital for my children and spouse. This hey day of health care continued for over three decades until I retired from nursing in 2010. During that time I saw every kind of abuse of this system one could imagine. From patients who claimed toothaches were medical emergencies and clogged up our ER's, to physicians who billed for patient visits when they never stepped into a patients room. I witnessed medical supplies being marked up 300% and insurances being billed astronomical fees for dressing changes or other procedures that took mere minutes. The US's health care system was destined to crash and it is is losing altitude daily. The initiation of Obama's Affordable Care Act was not the cause of this collapse, but merely a symptom of a convoluted system that rewarded crooked health care providers and third party payers and ruined the health of a people by focusing on the pharmacy of illness instead of on the educational requirements required to promote health. Our current situation is this. When I returned to college in 2014, I was automatically enrolled in the university's group insurance and the small premium was paid by my Children of Veterans Scholarship. That coverage ceased last May when I graduated. Keith was covered through one of the marketplace plans and received a nice subsidy making his monthly premium very affordable, about $20 a month. Then, when we did our taxes last Jan. we were fined several thousand dollars because ACA had miscalculated his subsidy based on our income (we were still receiving monthly payments from our contract for deed people on our Chatsworth farm.) It was ACA's mistake but we had to pay. So we did and we promptly did not sign up for any other plans. A few months later Keith cut his thumb badly with a circular saw and required 17 stitches. The ER bill was over $1500 but when we informed the hospital we had no insurance, they immediately dropped the charges to just over $800, which they allowed us to pay over time, about $100/month. Funny, how the "costs" of treating a patient suddenly lesson, when there is no deep pocket third party to bill. This year, before ACA's December deadline, we again investigated our options. Based on our projected low income we appeared to qualify for subsidies towards our monthly premium, our out of pocket costs and our deductible. But we also would qualify for our states Medicaid program (with an income limit up to 138% of the Poverty level of $16,200 annually, or around $22,000) if we did not elect a plan through one of ACA's approved providers. So, do we pay anywhere between $20-$100/month with assistance not guaranteed, for healthcare we may never use, within a program Trump is threatening to demolish, or do we take our chances, do all we can to stay healthy and, if a catastrophic event occurs, apply for Medicaid coverage when we need it? We elected the last option. Keep in mind, we have no plans to apply for government assistance via Medicaid, even though I paid into that system for decades, but if we must, we will. It's also important to know, all of our children are grown and financially independent of us, if we still had wee ones at home, we'd make different decisions. Over the years we've pulled far away from modern day physician care since it is the very rare one who doesn't rely heavily on pharmaceutical intervention rather than diet changes, or alternative medicine which was accepted medical practice until the "alternative" label took hold in the 1960's. Drug prescriptions interactions is the number one cause of death in the elderly and the number of drugs prescribed every year continues to escalate. It's not just the physicians fault, as many will tell you that patients come into their offices not only insisting on a new prescription for whatever ailment they have, but actually making suggestions for specific drugs and their doses. We also want to keep as much money in our own pockets as we can, and not toss it into the heathcare wind circling around us, hoping it will benefit it. I'd rather spend the premium money on lotto tickets. 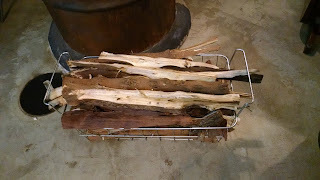 It is rare that either of us feels ill but when we do we go to to the basics; lots of fluids like healthy bone broths and raw milk, extra rest, fresh air every day, essential oils for stuffy noses, chests, honey for coughs and the occasional generic ibuprofen, for aches and pains. It is the last over the counter med we use and neither of us are on any prescription meds. We used to be on several meds, but over the last three years we have taken ourselves off them and substituted improved nutrition in their place. We understand fully either of us could suffer a stroke, an MI, debilitating cancer, but we feel strongly the more we take control of our own HEALTH instead of relying on western medicine to treat our illnesses, the more likely we are to live the life we are meant to live. It's kind of a crap shoot anyway as I cared for patients who never smoked a day in their lives who died of lung cancer and also for patients who smoked constantly and had only hemorrhoids as their big surgical need. 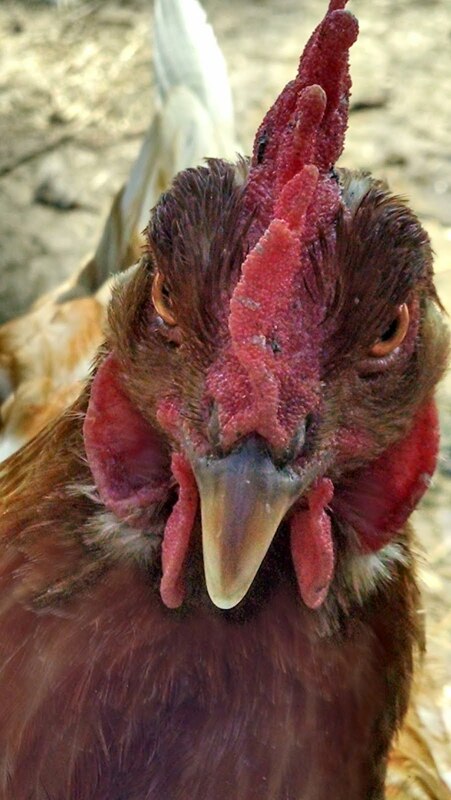 When we told our children of our plan to live and work here on The Poor Farm until the day we croak, one of our sons said to us, "Well, you don't want to just die outside chopping wood when you're 80 do you?" Yes we do, we answered. Yes, we do. This has nothing to do with budgets. For the last three years, since we bought this place, we've dreamed of being financially poor. Our greatest desire is to decrease our living expenses to the point that we can live under the US poverty line of $16,020, or at least, under the minimum amount that requires payment on income taxes, which in 2016 was $ 19,050. Finally, we can take solid steps towards that goal. 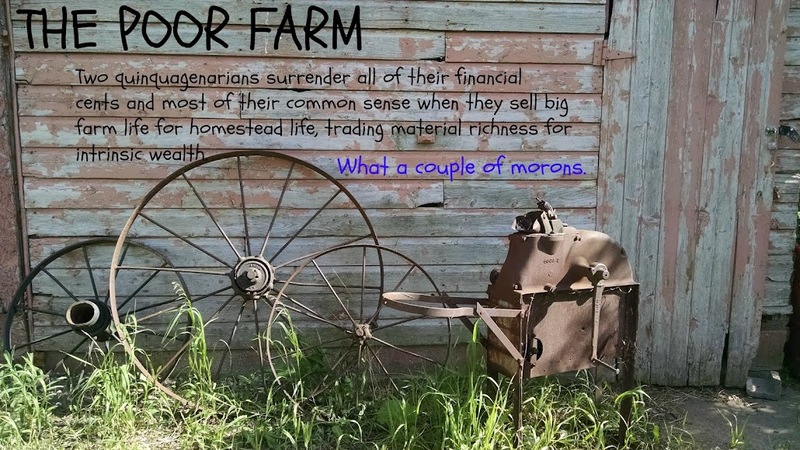 With our burden of owning two farms behind us, Keith and I were able to spend several hours yesterday, pen to paper, fingers to calculators, planning for our financial demise, our intended life of needing less in order not to have to work off farm. I don't know that I have ever been so excited about a new adventure in my life, except for my study abroad experience in Galway and maybe that one side trip to Kansas that one trucker took me on in 1978, other than those times though...never so excited. 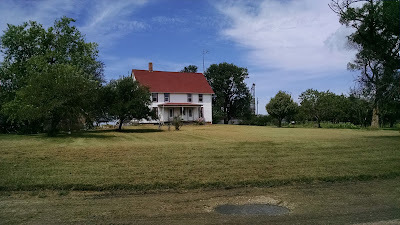 As we expected there was very little left over from the sale of our big farm, after paying off the mortgage, attorney fees and credit card bills which we had accumulated last summer to keep up on property taxes and farm insurances. The subsequent sales of our reclaimed livestock and farm equipment also resulted in disappointing totals, but at the end of the day we felt ready to move into phase two of our "Get Poor Quick" scheme. 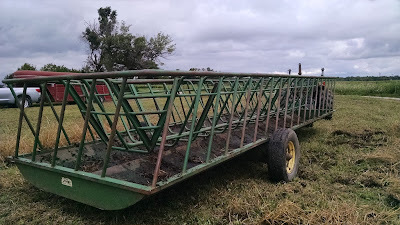 As of today, we are free of all credit card debt, own our vehicles, livestock trailer and tractor out right, have an itsy-bitsy savings account for emergencies and enough in checking for two months living expenses. We also have one small mortgage on this place and no permanent off farm jobs. 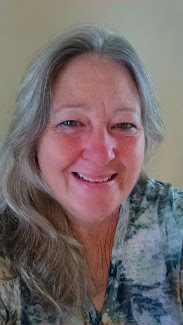 I retired from nursing 6 years ago and do not plan to return, yet I could if required. Keith is working a few hours a week delivering packages, as seasonal help for UPS. 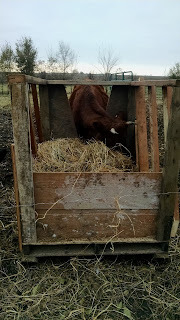 Traditionally, homesteaders are reluctant to share specific financial info on their blogs and I understand this, we do tend to be private folk; yet, on the other hand, whatever info we can share might help someone else reach that goal of self-sufficiency without suffering all the hard knocks we did. 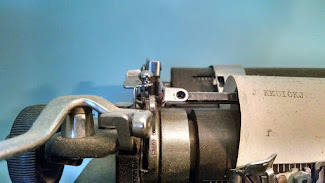 If we are willing to tell each other the best way to make butter, the most efficient way to seed a field by hand, the simplest method of grinding your own corn, should we not also help each other with the really hard stuff? The nickels and dimes? Just something to think about. So, to get things rolling, I'm going to share with you our proposed budget for 2017. Keep in mind these are projections only. They are based on our expenses last year which were by no means "expected". We'll know more about how realistic they are after a few months. Your comments, suggestions and questions are welcome. If you see something missing, like a vacation allotment or medical insurance, ask me. In a future post I'll talk about our plans for income to meet these expenses. As you can see, our current expenses will require an income that is $7620 over the poverty line. If we make this much we'll be required to pay income tax, which is NOT a goal of ours, So, we'll be working on ways to cut these expenses even more, so that we can further lower our required income to survive, and survive well. Tomorrow for example, we are interviewing several new insurance agents, asking who can meet our minimum needs for the least amount of money. Ironically, if we reduce our projected income from $1970/month to $1760/month, we would be eligible for food stamps, but government assistance of that sort, of any sort, is definitely not a goal. It would kind of defeat the whole self-reliant status wouldn't it? And the not paying taxes thing...that's another whole post. It will probably come just before my post about why we don't have health insurance. So, let me know how your homesteading budget compares and then hit me with your questions. I'm ready. Today at 10 am we closed on the Chatsworth farm. 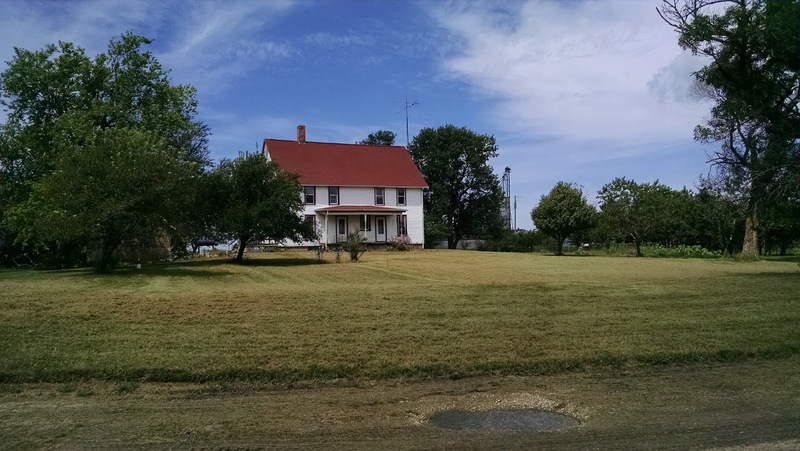 Sold for the second time in less than two years, and not on contract thank you oh so much, it is now owned by another couple who plan to live there forever with their goats, horses, cattle, pigs, dogs, cats, chickens and ducks. We've been working with this couple, and our banks, for many weeks, and are thrilled the deal is final. We are also sad, nostalgic, relieved, and mildly defeated, but generally happy to be moving on with our lives here on The Poor Farm. 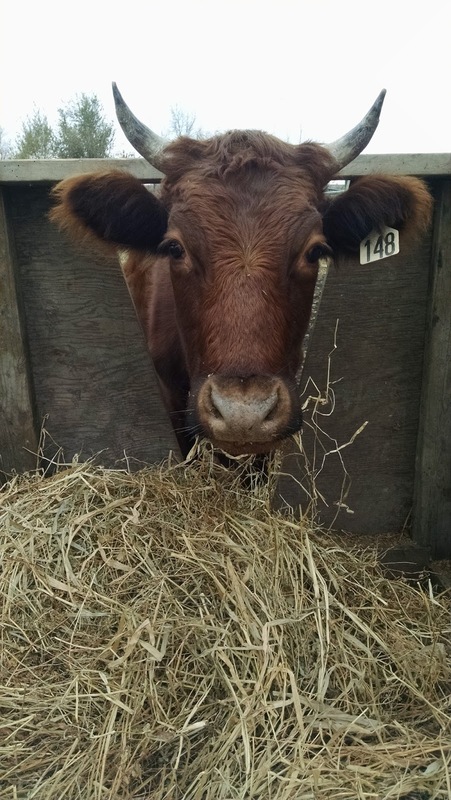 If you are new to this blog and wish to read the entire story about how the sale of our Chatsworth Farm went very bad, very fast, this past summer, please CLICK HERE. Tomorrow, Christmas Eve, Keith and I will be spending time with each other, and Christmas day will be spent with our children and grandchildren. On Monday we will begin the task of budgeting for 2017 with that goal of living under the poverty line of $16,020, as our financial guide. Now that we no longer have to pay two mortgages, two sets of utilities, two home insurance policies, two sets of property taxes, we can make the super tough decisions. Such as, do we need two vehicles? How much on-farm income can we produce? How much off-farm income do we need? Where will we get the cash to build a milk house? Can we learn to grow bananas in Illinois? Is it ethical to charge our GK's a homestead learners fee each time they visit? Monday will be a busy day. 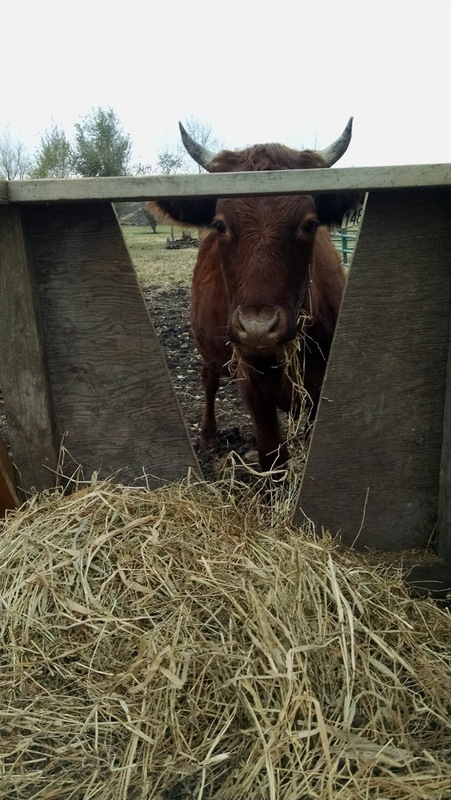 Before I sign off for the Holiday weekend, I do want to openly address Rick and Kelly Boge (Formally of Golden Guernsey of Illinois, now calling themselves Little-Farm Co-op) one last time. After today, they will not again be mentioned. We have so many wonderful and positive things in our life which deserve our attention far more than they do. I have three wishes for you both this Christmas Season. you have limited what those hard working folk could afford to buy for their own children. Stealing from children is a loathsome act . and then lied to their 80 year old faces. For that, I hope you feel shame. of people do it everyday. I wish you the courage to try. To my wonderful family and blog followers; thanks so much for all your support in this issue these last five months. We'll chat again next week. Mucca in pre-thaw state of mind. All day Tuesday I thought it was Monday, which meant on Wednesday, I thought it was Tuesday which means this morning I thought it was Wednesday until my husband clearly pointed out, it was indeed Thursday. Not only did I miss a day, but I missed it for three days. In my defense I had the flu Sunday night and was quite ill for about 24 hrs, Keith followed suit the next night but limited his bout to 12 hours. 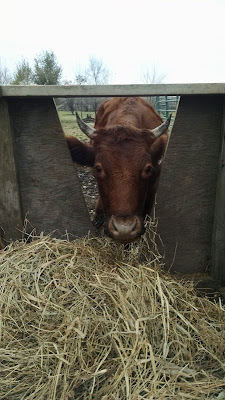 This is a rare occurrence for us raw milk drinking, holy basil sipping, honey swilling, good bacteria loving, homesteaders. pay for not having to even run the rocket mass stove last night. Life is good. A couple neighbors even dropped by while I was doing evening chores and handed me a big plate full of freshly baked Christmas cookies. Who does that anymore?!? The best people do, that's who. Tomorrow it is going to get even better. Stay tuned for big news. BIG BIG news. Three years ago, on the old farm, we dumped the microwave. I needed counter space. We also had been reading about ill health effects from using one, and as I was cooking more from scratch and using less packaged foods, we noticed our microwave heated and re-heated meals were tasting rubbery and cardboard-like. Our taste buds were waking up. We missed the microwave for about a week, then the pain was over. Now, in the summer, we heat up food on our small propane powered stove ( we keep a 100 pound tank just for the cook stove) but in the winter, we often use the barrel top of our rocket mass stove. 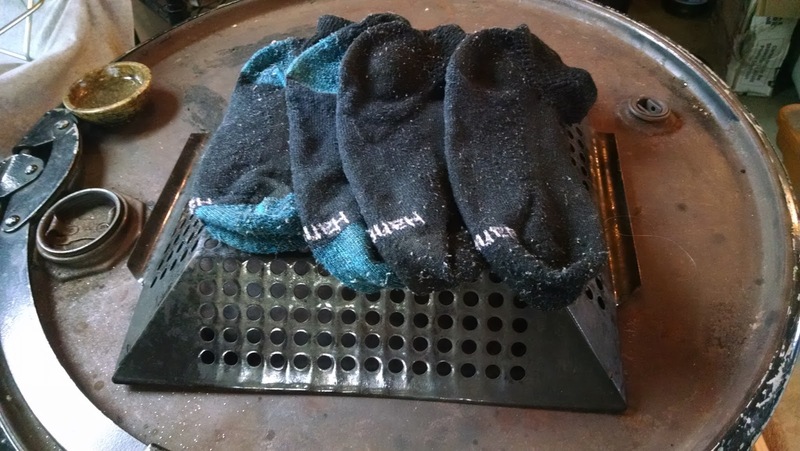 When the RMS is running full bore, about an hour into a two hour burn, we can fry eggs easily, re-heat anything, keep our mugs of tea or coffee hot and steamy. It is reassuring to know that if we lost electricity, or our ability to purchase the tiny amount of propane we use for the cook stove, we have the ability to heat our home and cook food on the RMS. We have oil lanterns for light. 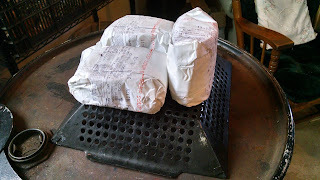 When the RMS is cooling off, it's the perfect temp for defrosting frozen meat, or raising bread. Of course, this all takes timing and planning. Thus the reason one would never call the RMS a "convenience appliance". One and a half years ago, we gave up our electric clothes dryer, leaving two of them on the old farm, but never installing one here. In the milder months- March through November- clothing goes outside on the line. 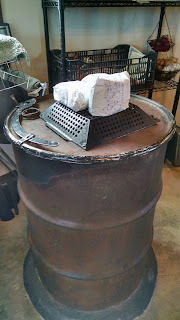 Now, moving into winter, Dec-Feb., I will mostly turn again to our rocket mass stove. I learned the hard way last year, that lying clothes directly on the stove when it is hot, is a great way to fry your socks into oblivion. This year I hang clothes just behind the RMS on a metal rack and spread them out on a grill basket (a gift from my sister Mary) or a wire freezer basket on top of the RMS. I still need to flip the clothes on the basket once in a while for even drying but I'm usually in the kitchen cooking, cleaning, or soap making, so it's no trouble. The additional bonus, our clothes come out fairly wrinkle free, which is nice for the occasional family event. Our critters have never cared about the wrinkle status of our clothing, or if they did, they've been gracious enough not to mention it. The decrepit house on our property, circa 1865, has it's positive points: it hasn't collapsed yet, it provides great shelter for our guard dogs, and it has an old root cellar. 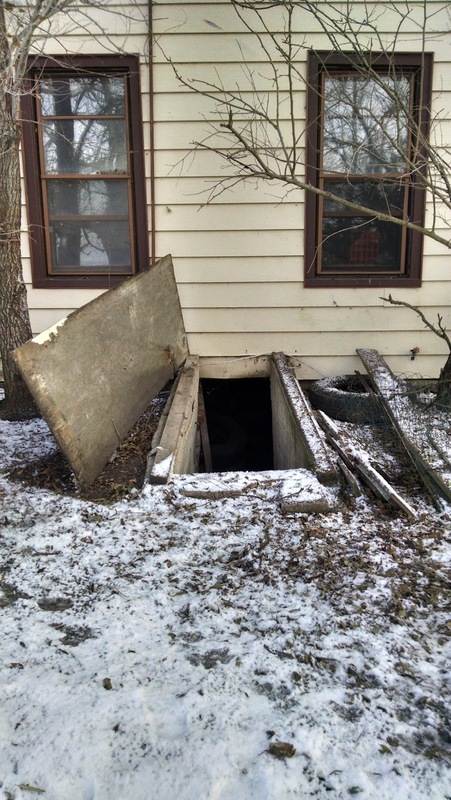 Once we repair walls, stairs, put on a new door, close off the connected crawl space that extends under the house, empty it, clean it, build shelves in it...once we do those things; we'll have a usable root cellar. In theory. 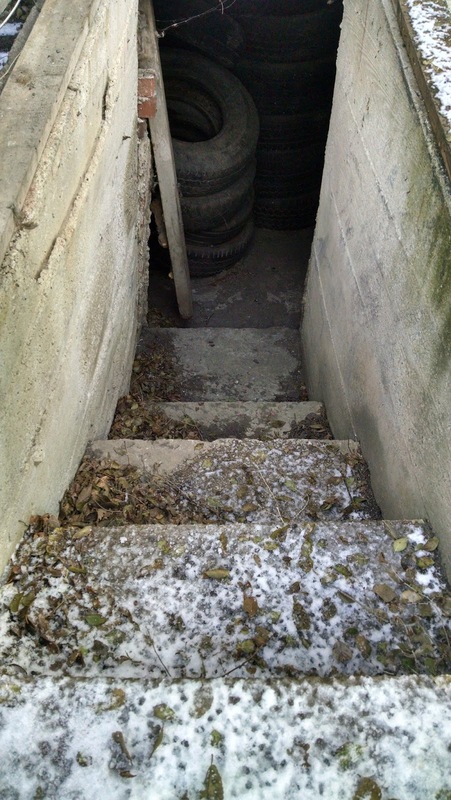 We did not have such serious root cellar desire last year, as the summer of 2015 was very wet, we'd only been living here a few months and we still had income to buy vegetables. This year, however, we plunged into our garden jobs and thankfully, the land produced good amounts in return. The problem has been storage. 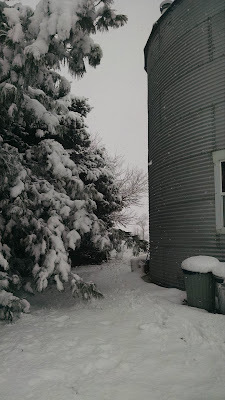 In our feed shed we have an old refrigerator, unplugged, that served as dry storage for popcorn, and large potatoes, plus we were able to store pumpkins, sweet potatoes, onions and fingerling potatoes in open sided crates stacked on shelves and the floor. We also canned large amounts of other things like tomatoes, beans and more sweet potatoes which have been crammed in our small kitchen. But with the rapid decline in temperatures these last few days (wind chills of -7 tonight) we knew these veggies left in the feed shed would freeze, so into the Looney Bin they came. 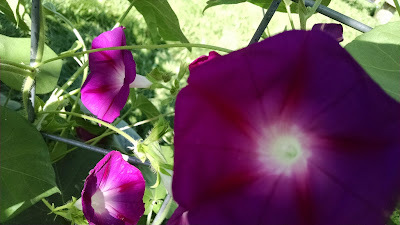 We now have sweet potatoes in coolers under our kitchen table, pumpkins tucked under the stair eaves, potatoes in the shelf unit behind the rocket mass stove and onions braided and hanging off the floor beams. Feng Shui it ain't but at least we won't starve. Next year, we'll fix and fill the root cellar. It's a plan. Hard to believe Christmas is just two weeks away. This year the family will be getting lots of creative gifts. Hope they're up for that. Now, on to soap. 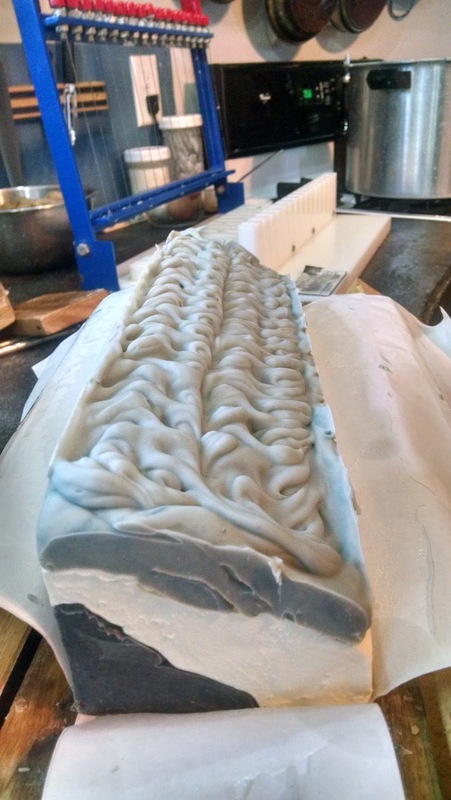 I had fun with this bar, by keeping my mold tilted while I poured the three layers. 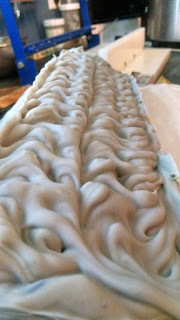 Also enjoyed playing with the top of it, building in deep swirls with the end of a metal spoon. The color above is more true to the bar, a pretty grey blue for the top layer (colored with oil infused alkanet powder) and a very dark navy blue on the bottom (colored with indigo powder). Scented with a blend of Lavender, Patchouli and Rosemary, this is a hippies herbal dream. I have 10 bars available. The next bar is less dramatic visually, but rich in scent, as I used a deep pine essential oil. A whiff of this is like rolling around in a forest of Christmas trees, over run with reindeer, all wearing little red hats. Pure Christmas. 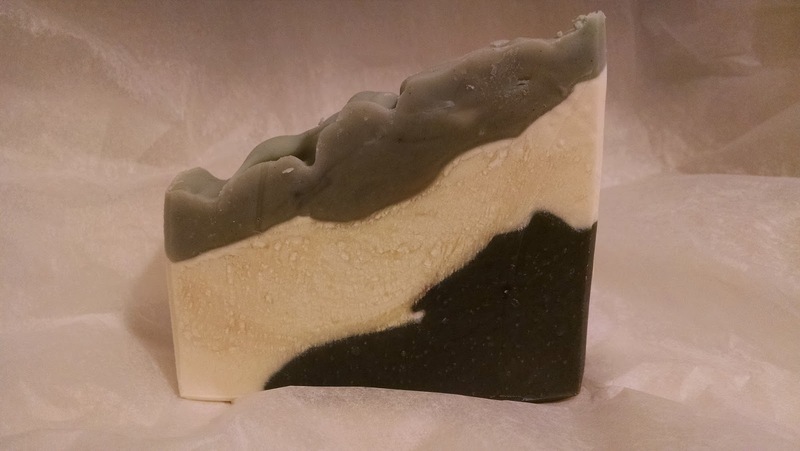 It's colored with titanium dioxide for whiteness and a mix of Spirulina and Nettle Leaf powder. 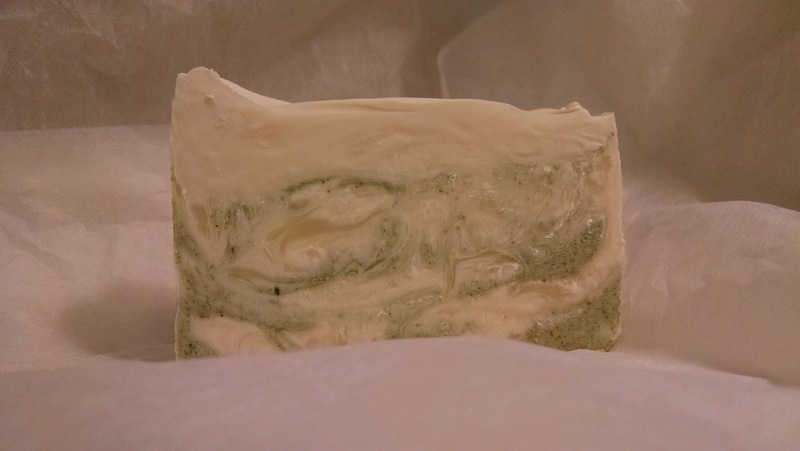 I also have ten bars of this soap available. 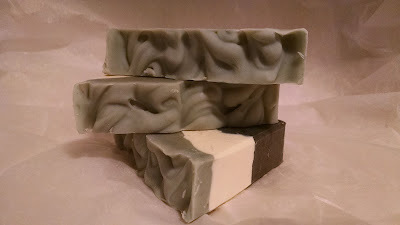 Both bars are made with coconut, olive, sweet almond oils and 10% Shea butter which results in a soap that is rich in thick lather and very moisturizing. 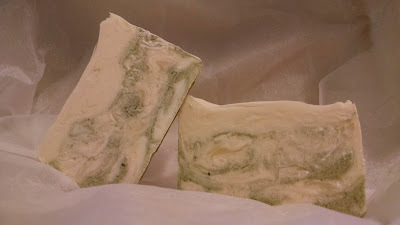 My soap bars are a hunky handful and are $5 each plus postage. Email me at opies99@gmail.com if you'd like to order. They worked well for feeding huge round and square bales to 20 or 30 head of cattle at a time. But those feeders, too big for our needs here, were sold this past summer. 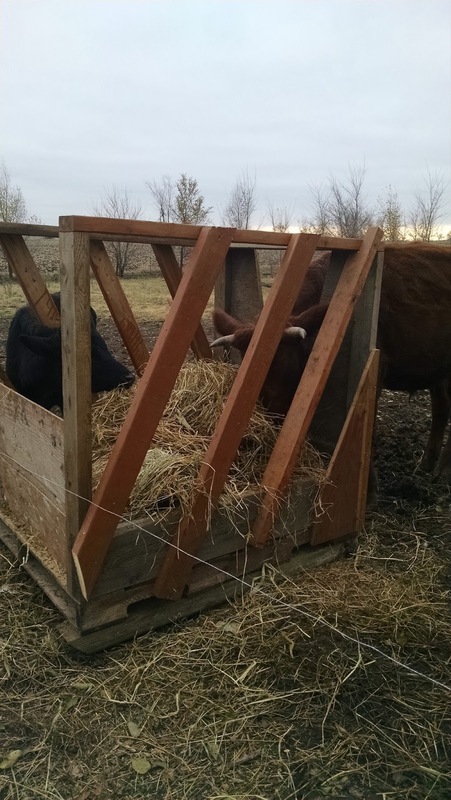 Now that pasture season is gone we needed a way to feed winter hay to our petite herd of three steers. Open near the back where the electric wire runs, it allows easy access for us to fill. 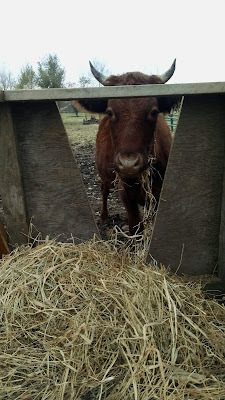 In the front Keith cut a large V in a leftover piece of wood, which allows our biggest steer to pass his head and horns. Whereas the sides have narrower slats which he cannot fit his head into. We hope. Cattle can be cattle. 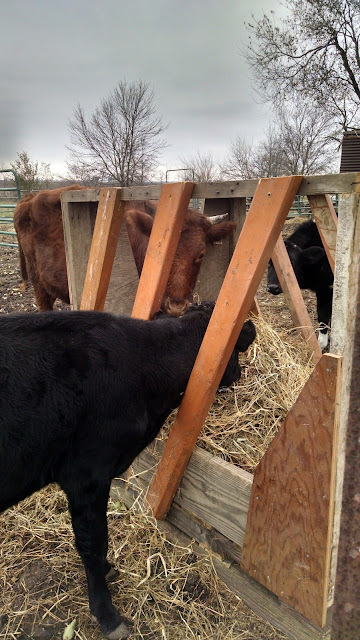 This allows the two smaller calves to eat alongside the big steer, without him pushing them out of the way. 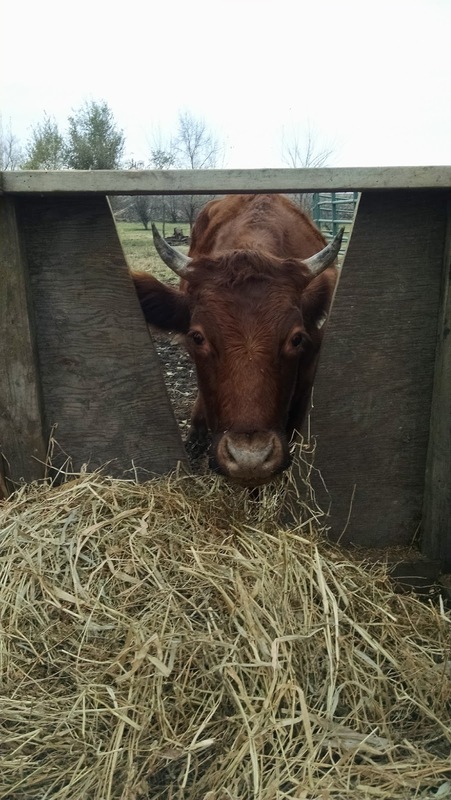 Keeping hay up off the ground helps decrease parasite issues and allows us to monitor how well they are eating over the winter, which is a prime time for weight loss as extra energy is used by the animal to maintain body heat. It happens every year, and yet I still find it special, that first snow. 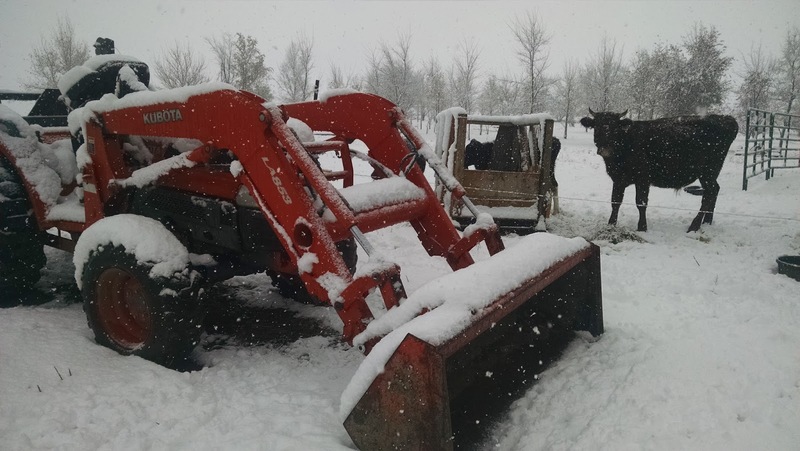 Some years we get a few flurries with the initial cold weather shift, but this year we got the real deal, about 5 inches of heavy wet stuff two days ago. I run nostalgic about first snows, remembering the big storms of my life like the huge Chicago snow of 1967. I was eight years old and we lived in a three story walk-up. 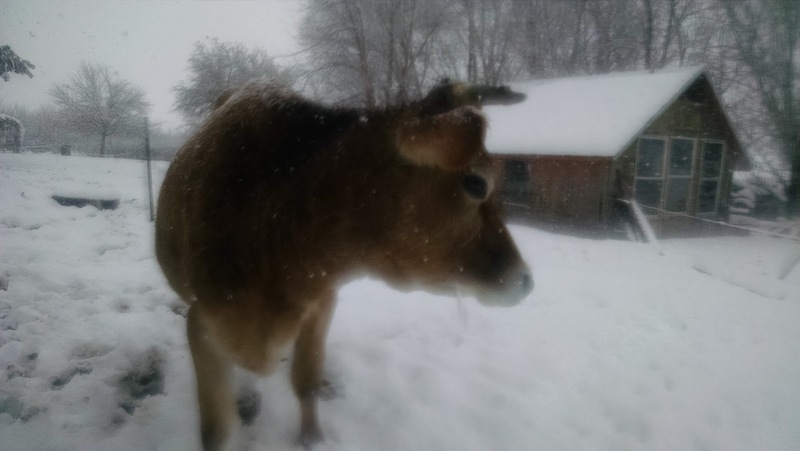 With three other babes at home, my father took my six old sister Mary and I out into the storm of the century to bring home bread and milk. He pulled us on a sled down the middle of Ashland Ave. where no motorized vehicles were running. It was exhilarating! 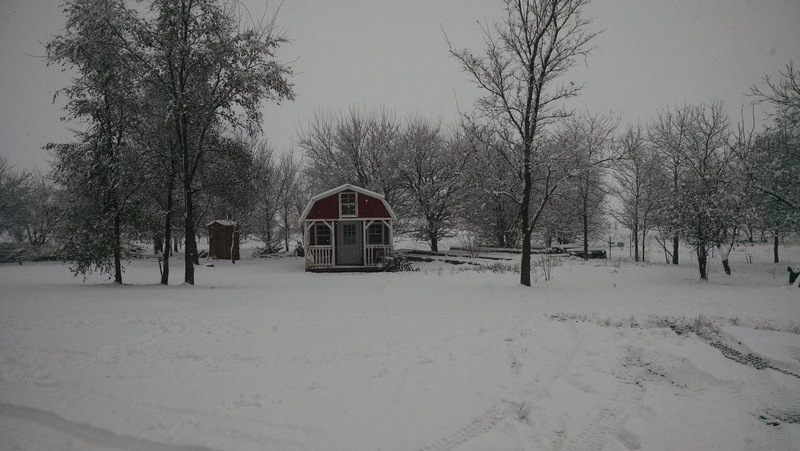 This snow, 49 years later, was absolutely benign compared to that, but still; it reminds me of my fathers' ways: his intent to keep his family safe, warm and fed, his desire to prove a little weather couldn't slow him down, his unending love to have fun in life. 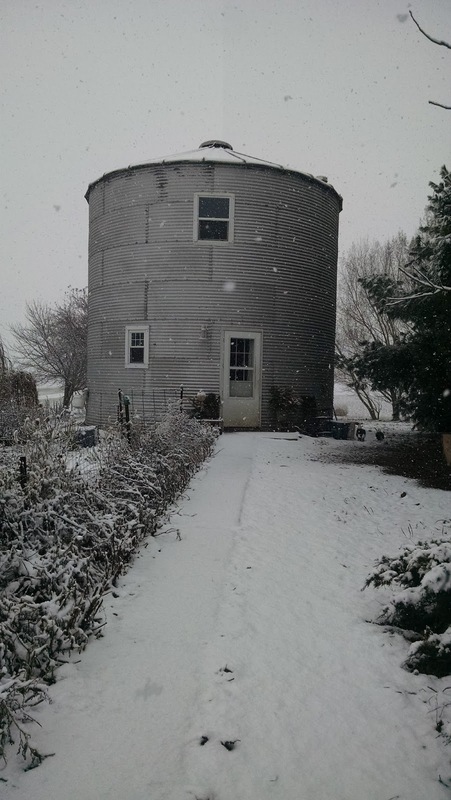 Thankfully, we had our animal shelters secured just prior to our minor snow of 2016, and our Rocket Mass Stove is working just fine. 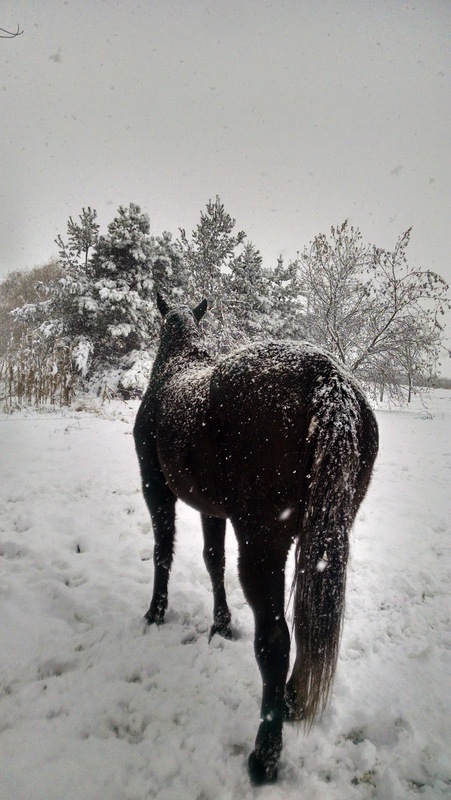 My horse Ennis though, only occasioanally hangs out in her livestock trailer shelter. She's always been a bit of a snow bunny. We do need a good tarp for our sole tractor as there is no barn or garage (yet) to house it. Take note for anyone related to us reading this blog, who needs a Christmas idea. Yes, subtle, that's me. Of course, someone always gets stuck in our drive, which is sorely lacking for a good bed of gravel. 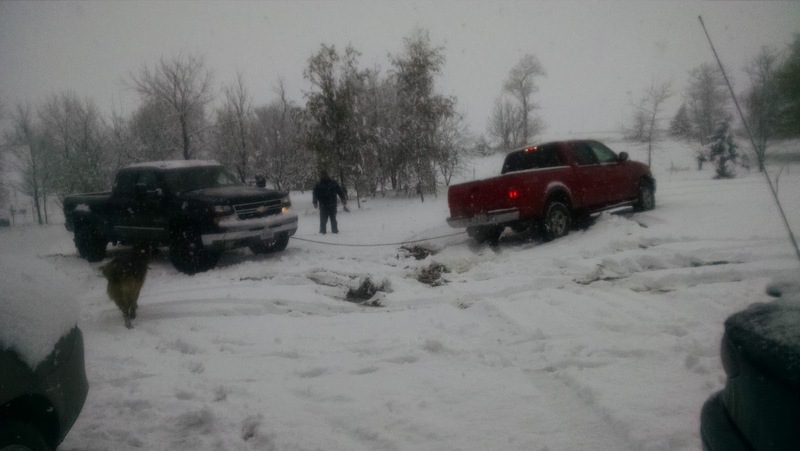 Problem solved with the old truck and a chain pulling out the newer truck. This next weeks temps will drop into the teens but for us, frozen ground is so much better than the deep mud we had yesterday after the temp went up and melted about half the snow. All our ground hoses are out of commission now for the season and water must be carried to our livestock, which is not too much of a burden since our numbers are so small compared to the years we were on the big farm. We carry multiple five gallon buckets for one horse, two cows, four steer and the chickens/ducks. 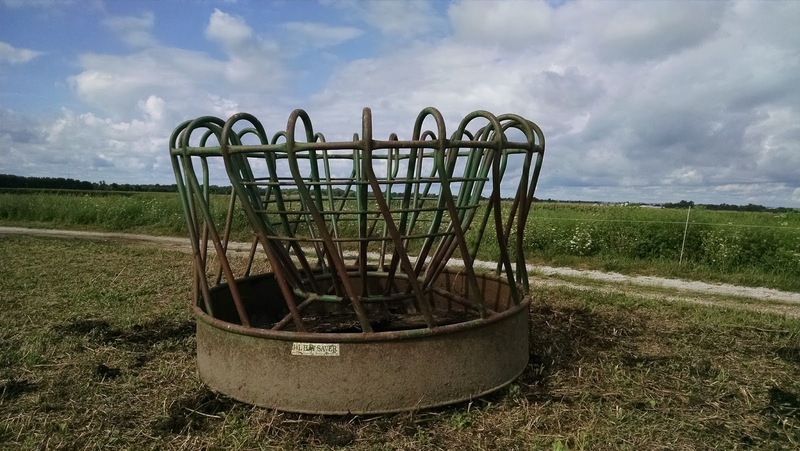 The dogs and cats drink out of any of those water troughs as desired. Our Looney Bin was built between a tall thick grove of Evergreens on the south and smaller trees; a Weeping Mulberry, an Aspen, a grove of wild Plum. 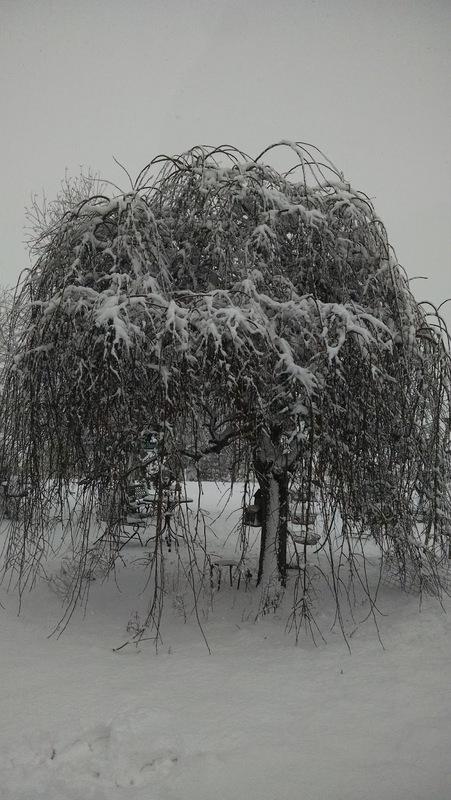 After this snow it looked like we tucked inside a fluffy ball of cotton candy, where the wind never really hits us, but just swirls around us. My grandparents, Tom and Josephine O'Shaughnessy, lived for some time on Moody Avenue in Chicago. We lived only blocks away, in my early childhood, and we visited them often. Their home was typical of a couple who raised their children during the Depression. 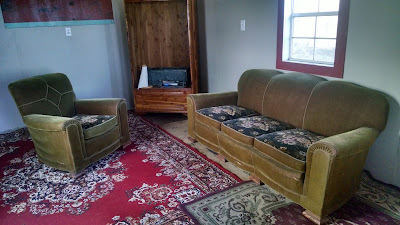 A few good pieces of solid wood furniture, but mostly hand-me-downs from others, a real hodge-podge of style. But, it was warm, comfortable and inviting. It was my grandmother who taught me to always offer coffee and something to eat to any guest who visited. She also read me my first poetry as she was a published poet herself. She would have me sit at her feet while sitting in her rocker, reading her own poetry and the poems of her mother, to me. I loved her dearly and still cannot believe I was only seven when she died, as my recollections of her are so strong. It's those memories that are forefront as I create my little writers studio. After repainting the walls a neutral grey and leaving the window trim and loft beams, deep red, I gathered all the vintage rugs we had from the old farm house and covered the contemporary vinyl floor from wall to wall. The large red rug above was a giveaway to us over 20 years ago, I have no idea how old it is, but we had thousands of family meals over that thing as it sat in our dining room. You can't see it in the pics, but there is a metallic green paint spot in the middle. A gift from a grandchild, which makes the rug that much more valuable to me. 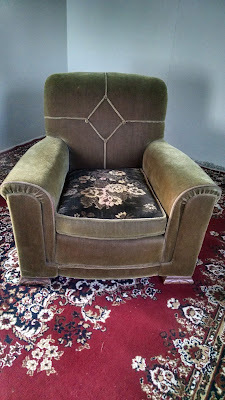 My recent score is the matching couch and chair (above) which I found on Craigslist. It too has a story. Purchased in 1935 by a young farm couple in rural Melvin, Illinois, this Sears brand set was their "company furniture". Long since passed, their grandson, about my age, told me of visiting his grandparents often but never being allowed to sit in the front room where the matched pair resided. That room was only used when the pastor or other important folk dropped by. Consequently, the two pieces are in excellent shape for their age and much smaller than they appear. My feet rest firmly on the ground when I sit in the armchair which is a thrill, because at 5ft 1in my feet often end up dangling mid air Lily Tomlin style. My kids don't think much of the furniture with its flowered seats and mossy green upholstery, wondering why I would spend money on something that was-For Gods Sake-over 80 years old, but they're young and not too sentimental as a rule. I have a feeling though my GK's will like them. I hope so because I plan to leave them the pair. After I have them sit at my feet and listen to MY poetry. Next up for my studio: the conversion of my parents 1950's buffet into a desk, the hanging of vintage artwork for the walls (I have a few Andrew Wyeth prints that will fit ) and lots of shelves for lots of books. Oh, and some sort of small wood stove or propane heater. Eventually electricity would be fab as well.